Given all the five- and seven-letter words (squid and vampire, respectively) hurled at Goldman Sachs back in '09, you can't blame Goldman CEO Lloyd Blankfein for sucking up to Kenny Feinberg, a.k.a. President Obama's former Pay Czar. However, you can certainly bust his chops for it. 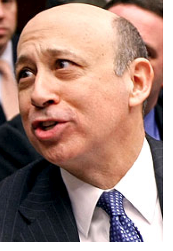 In a September 2010 interview (just released yesterday) with the Financial Crisis Inquiry Commission, Feinberg said, "I had no jurisdiction over Goldman, but Goldman had me up there to see Blankfein four times." Feinberg, who did have salary and bonus jurisdiction over several other big firms, recounts what Lloyd told him when he swung by the Goldman offices: "Ken, if we do it this way, if we only pay our people $600,000 cash, and any bonus that they get, they get in stock, and they won't get it for five years, am I doing OK?" Why Did Wells Fargo's CFO Really Retire?